This artwork began life during my visit to San Cristóbal de las Casas, Chiapas, Mexico in March 2014, surrounded by Tzotzil Mayan images of sacred crosses dressed as trees and representing the mythical axis of the world. During a night-time fire ceremony with Mam Mayan priestess Flori Perez under the stars, I fell into a light trance, and closing my eyes to the outer world I saw these sacred crosses transformed into a magical tree stretching up to the stars, which I understood to be the tree of life and death. 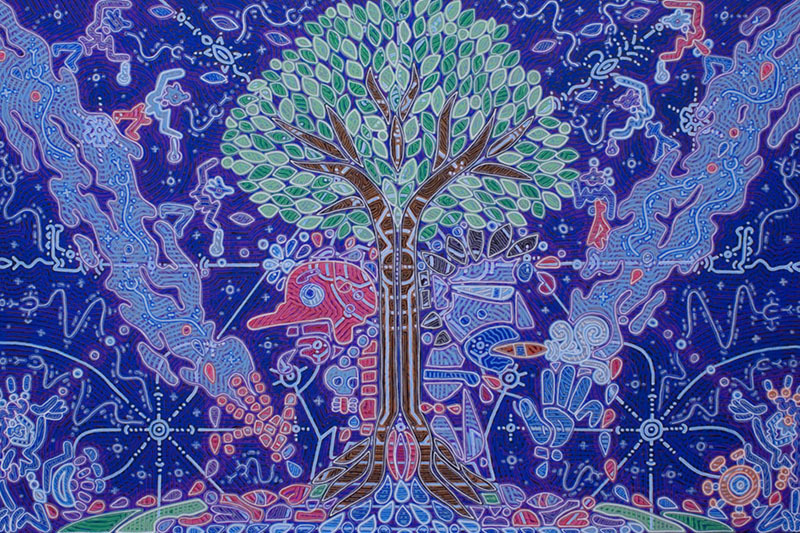 This resonated with an artwork of Huichol shaman Ramón Medina Silva, The Soul's Arrival In The Village Of The Deceased, in which a revitalising tree feeds the ancestors. Here, then, we see the world tree in the heart of the sky represented by the triangle of three stars, flanked by the Milky Way and animated by visionary beings. See also Nichimal K'ok' Ta Vitz ~ Flower Fire on the Mountain. 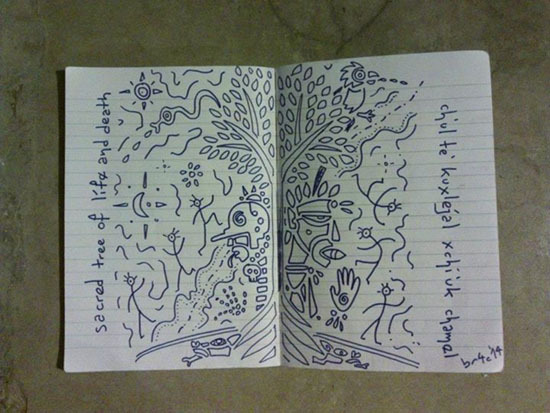 Tree of Life and Death from Bruce Rimell on Vimeo.